The Mizzou Tigers kickoff this Saturday at 6:45 PM at Memorial Stadium against the Texas A&M Aggies. This weekend’s game is the Blackout game so make sure to wear black! You can find the official blackout shirt at The Mizzou Store. Also: After the game each senior football player will be taking their own white rock from the Big M in the North end zone, so stick around to support our Mizzou seniors! It’s Football Friday, every Friday of home football games at the Walton Building! Be sure to stop by the Walton Building, location of the Convention and Visitors Bureau, on Friday for visitor information and cookies! Bryan-College Station, Texas Welcomes Tiger Fans! HOWDY! The Texas A&M Aggies welcome you to Bryan-College Station. We hope you feel right at home as you make your way into Aggieland. The Bryan-College Station area has much to offer, so here are a few tips to make your experience one of a kind. Kyle Field. Home of the Texas A&M Aggies. Game days are always exciting here in Bryan-College Station. Eager fans from both teams begin tailgating early in the day and can be found all around Kyle Field. 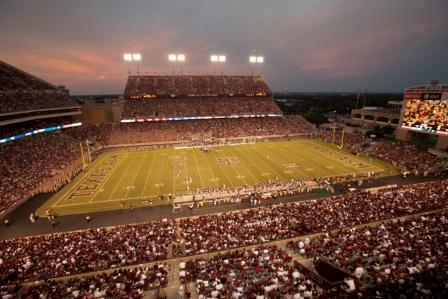 The roar of 87,000 screaming fans in Kyle Field is something you won’t want to miss. 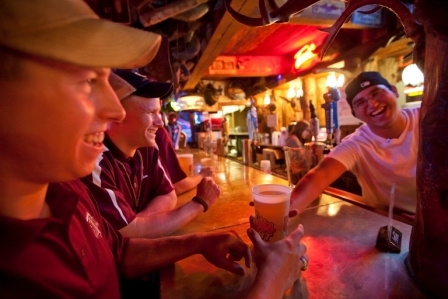 Though many see the University as the hub of Bryan-College Station, there are many things to do to keep the fun going before and after the football festivities. While you’re in town learn more about Texas A&M and its traditions and history by visiting some of the places on campus such as the Bonfire Memorial, a dedication to the 12 Aggies who lost their lives in the tragic collapse of the 1999 Bonfire, the Appelt Aggieland Visitor Center, the Sam Houston Sanders Corps of Cadets Center, and the Lettermen’s Association Athletic Sports Museum. After the game, fans frequently move the excitement and party to the Northgate Entertainment district where you must stop by the Dixie Chicken. The Dixie Chicken sells more beer per square foot than any other place in the United States. Downtown Bryan is also bursting with live entertainment, shopping, food and more! Plus, it is just minutes from the central College Station area. With almost everything within walking distance, you can stroll the streets while enjoying the art galleries, night life, and striking scenery. The George Bush Presidential Library and Museum is another popular stop. Here you can walk through exhibits that chronicle George Bush’s life and presidency. This historic spot continuously makes the list of Texas’s 30 most visited attractions and is certainly a must-see while in the area. For a relaxing night visit Messina Hof Winery and Resort the fastest growing, most awarded premium winery in Texas. Wine tasting, vineyard tours, and fine cuisine make this an unforgettable experience. If you’re looking for great food you happen to be in luck; Bryan-College Station offers some of the best local food in Texas! No matter what you’re craving (fine dining, the family-owned atmosphere, or something one of a kind) we have it all. Whether staying an extra night or just passing through, we hope you take advantage of all Bryan-College Station has to offer. Enjoy your stay!